You are here: HomenextPeoplenextPlayer ProfilesnextCromwell, Arthur "Joe"
Arthur “Joe” Cromwell played for Gloucester at both the Spa and Kingsholm. He was very strongly built, and tireless around the field. He normally played at forward, and was renowned for his powerful scrummaging, but he could fill in at any position, and also performed for the Club at half-back and full-back. Hockey and rowing were amongst his other interests. He was born in Gloucester in 1861, the son of a carpenter and joiner. By the time he married Emily Hannis in 1881, he was employed as a paper hanger. He played his first game for Gloucester away at Bath on 13th October 1883, and was doubtless elated to score a try on his debut, although to put it in perspective, it was only one of seventeen tries scored by Gloucester that afternoon without reply. Joe went on to play 8 matches that season, under the captaincy of Jimmy Boughton, also scoring a try against Cirencester Royal Agricultural College. Thereafter he spent several seasons in the second team, until his first team career resumed in 1887-88, under the captaincy of T G Smith, with a further 10 appearances. In the second match of the season, he scored a try, the opponents again being RAC Cirencester. The following season, Joe was a first choice selection, and played in all but two of the Club’s 22 fixtures. Only three matches were lost that season; four matches were played against Cardiff, the first three were drawn, but Gloucester won the last in Cardiff, and when they returned to Gloucester the team was greeted by a large crowd who carried the players through the City on their shoulders. In 1890-91, the captaincy passed to Tommy Bagwell for the last season at the Spa, and Joe appeared in 24 of Gloucester’s 26 fixtures, with only two games lost away to Penarth and Swansea (and the second team were unbeaten). Joe scored tries against Llanelly and Clapham Rovers. By this time Joe was also playing for Gloucestershire in a team which reached the County Championship Final. This was played against Lancashire at Manchester, when Joe was one of 14 Gloucester players (the exception was Sid Nicholls of Cardiff) in the Gloucestershire side which went down by 4 goals and 2 tries to nil. The very first Gloucestershire caps were awarded to this team. 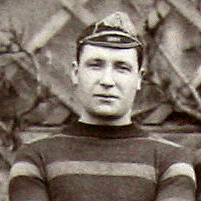 Tommy Bagwell remained as captain for the 1891-92 season, Gloucester’s first at Kingsholm. Joe made 30 appearances, missing only 4 of Gloucester’s 34 fixtures, of which only six were lost. His appearances included the first match at Kingsholm on 10th October 1891. He scored 8 tries against Old Edwardians, Barbarians, Devon Albion, and Rest of County (5), and kicked a conversion against Exeter. On 28th March 1892, the Barbarians visited Gloucester for a match at the new Kingsholm ground, bringing a team described as “15 members of some of the crack combinations of the country”, Cambridge University, Blackheath and Harlequins players making up most of the team. Joe Cromwell as usual played at forward, and also as usual he kicked off to get the game underway, and went on to play a prominent part in the match. He scored a try in the first half, during which he was involved several times in the build-up; the Citizen’s match report described how: “Gloucesterhad to act on the defensive for some time, the visitors wheeling beautifully, but eventually Cromwell got relief by carrying the leather from a lineout. He knocked on, but the referee did not notice the mistake, and Bagwell took the oval to mid-field. Some fine passing by the visitors’ three-quarters took the ball back into the home territory. George and Cromwell did some good foot-work, and the latter bothering Johnston at the centre, Ball picked up and ran into the visitors’ quarter. Here he was overtaken, but, passing to Cromwell (the Barbarians unsuccessfully appealed for “forward”), the latter got over under the posts.” This contributed to Gloucester’s eventual win 10-9, 2 goals to 1 goal and 2 tries (at the time a try counted 2 points and a conversion 3 points). This proved to be Joe’s last season as a first team regular. He made only two appearances in 1892-93, and a further seven in the early part of the 1893-94 season, which included kicking a conversion in an 8-3 win at Leicester. He played his last game for the Club at home to Newport on 4th November 1893. His career statistics for Gloucester were 118 appearances, 20 tries and 2 conversions. He also represented the County ten times. After the end of his playing days, Joe was employed as a house decorator, but remained closely involved with the Club. For many years, he acted as a trainer, both as assistant to Tommy Bagwell, and as the trainer of the United team. He continued in this role at least until 1926, by which time he was age 65. Joe died in Gloucester in 1938, age 77.